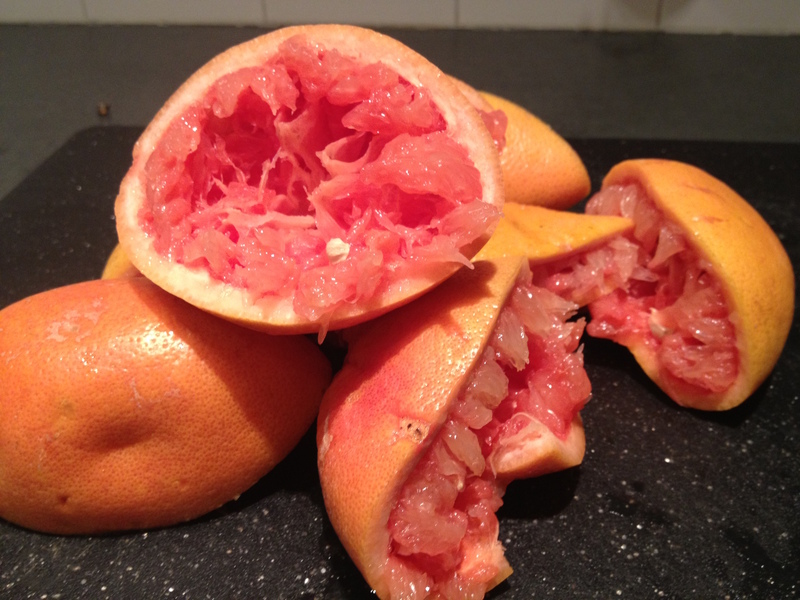 I’m deep in a relationship with ruby red grapefruit right now. It could be because its almost National Grapefruit Month (who knew?). Or it could be that I am completely sick of all the rich, hearty foods of winter and I’m craving things that are light and refreshing. 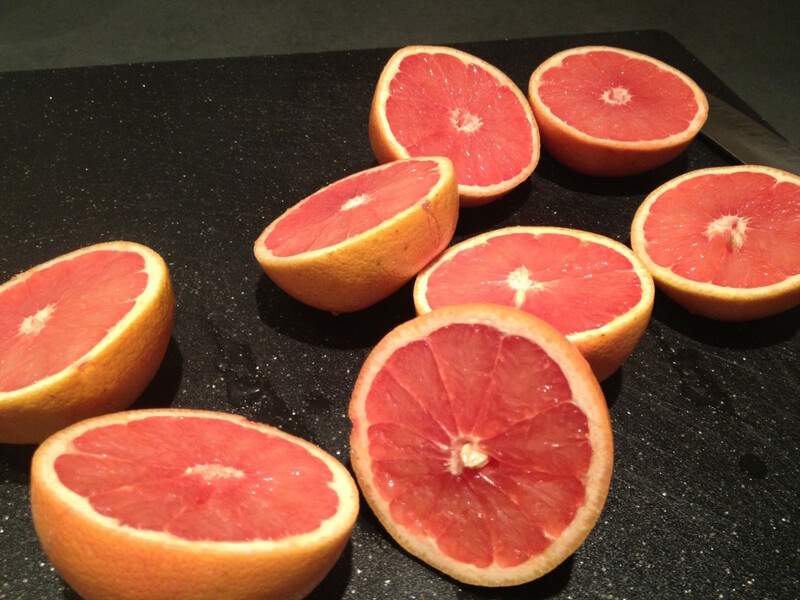 Red grapefruit is high in lycopene which is linked to preventing cancers. Bursting with vitamin C; half of a grapefruit provides 78% the recommended daily value- which means a healthy immune system. Antioxidant rich, which supports cardiovascular health by preventing the oxidation of LDL cholesterol. Contains limonoids, which help with detoxification by forming an enzyme that helps cause toxins become water-soluble, allowing them to be more easily flushed from the body. Rich in pectin fiber that slows down the development of atherosclerosis. Low in calories: 1/2 grapefruit is only 36 calories. Great source of vitamin A, necessary for healthy vision, teeth, skeletal, and soft tissue. 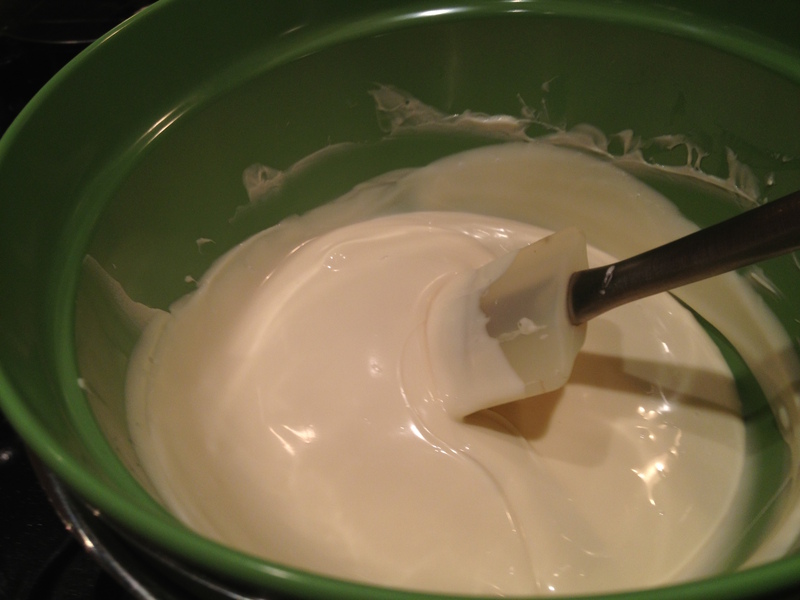 Also high in vitamin B5, needed by the body to metabolize proteins, fats and carbohydrates. Good source of folate, crucial for brain function and for production of genetic material such as DNA and RNA. Plus potassium, which is essential to heart function and smooth muscle contraction. 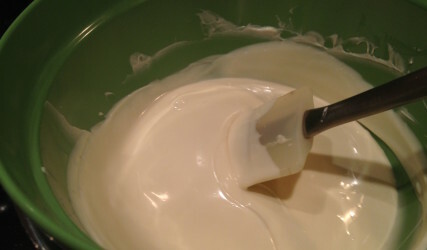 Because it is rich in vitamin C, it stimulates collagen production- which helps retain elasticity. Score! And all those phytonutrients it’s packed with protect your skin from sun damage, and also reduces toxins from the body which can make the skin smooth and clear. 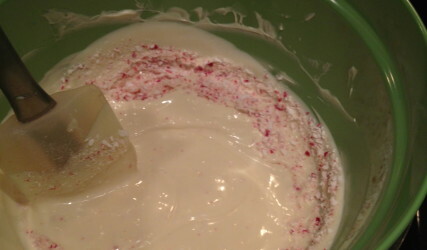 There are tons of recipes for beauty treatments using fresh grapefruit, too (but I’ll stick to my fancy-pants products). 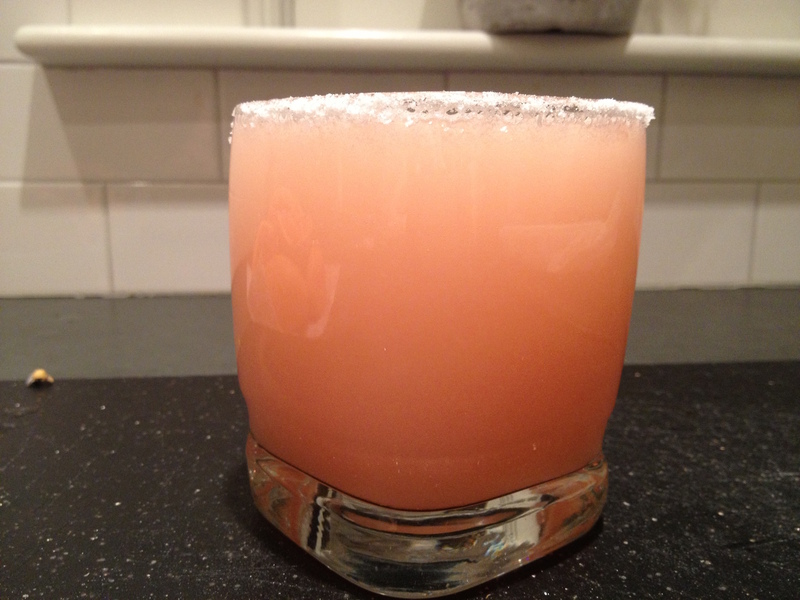 I’m sure this negates some of the benefits of grapefruit: Mixing it with 1 part vodka and three parts grapefruit juice, shake and serve in a salted glass ain’t a bad way to end the day. 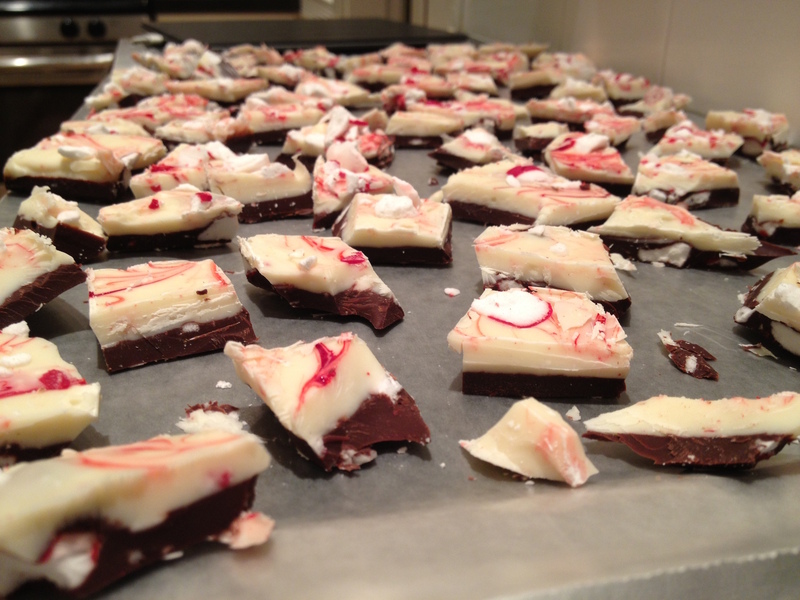 It’s that time of year that I make lots of little treats in my kitchen and send them out into the world. 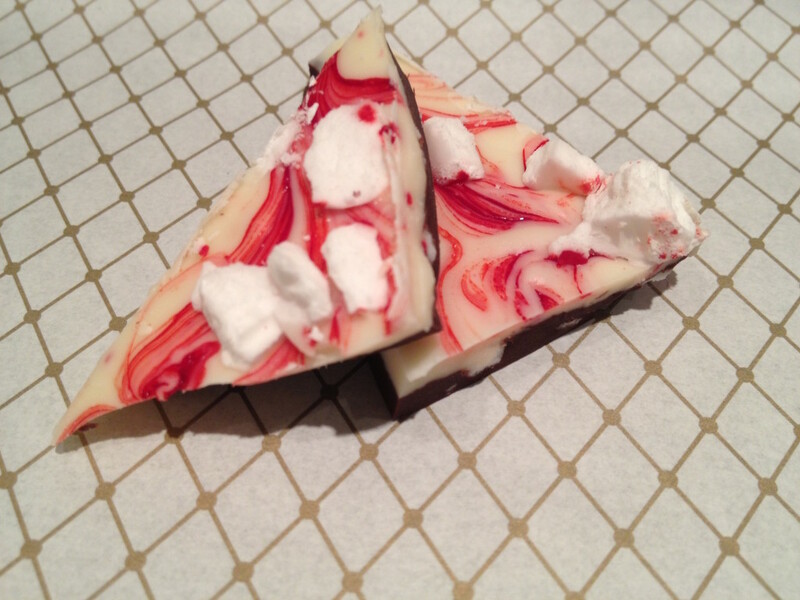 The only thing I love more than making gifts for people, is wrapping them. 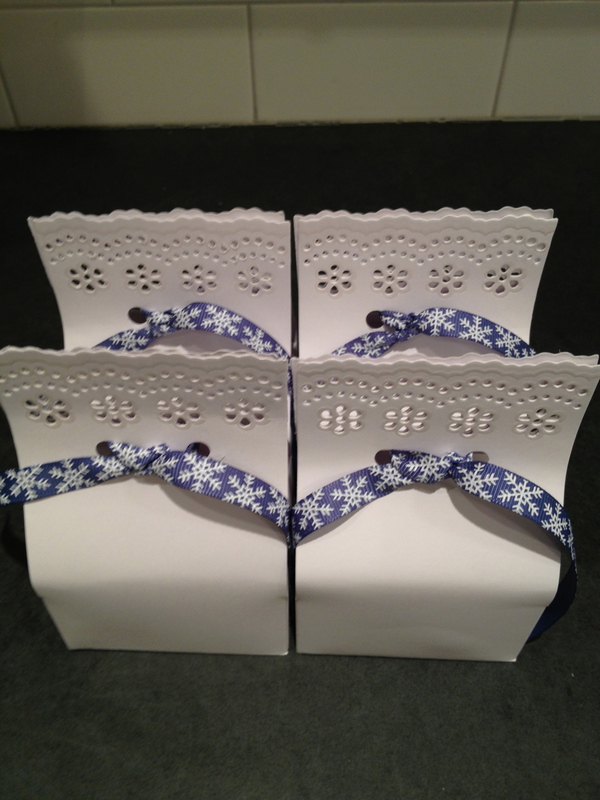 I love all the ribbon, the tags, the boxes- it’s just like accessorizing! 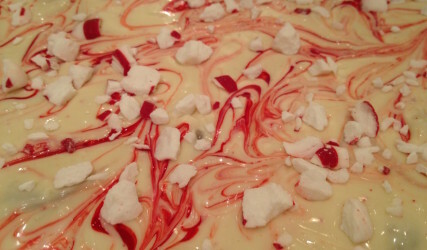 This year my holiday candy included Peppermint Bark, Toffee Brittle, Pistachio & Cranberry Nougat, and Vanilla Marshmallows. 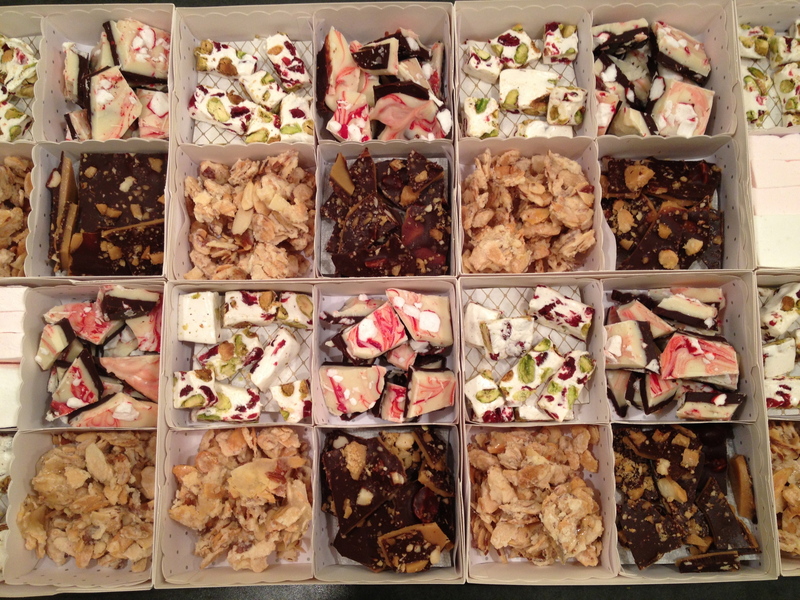 I like to use Martha Stewart’s Treat Boxes to package them. 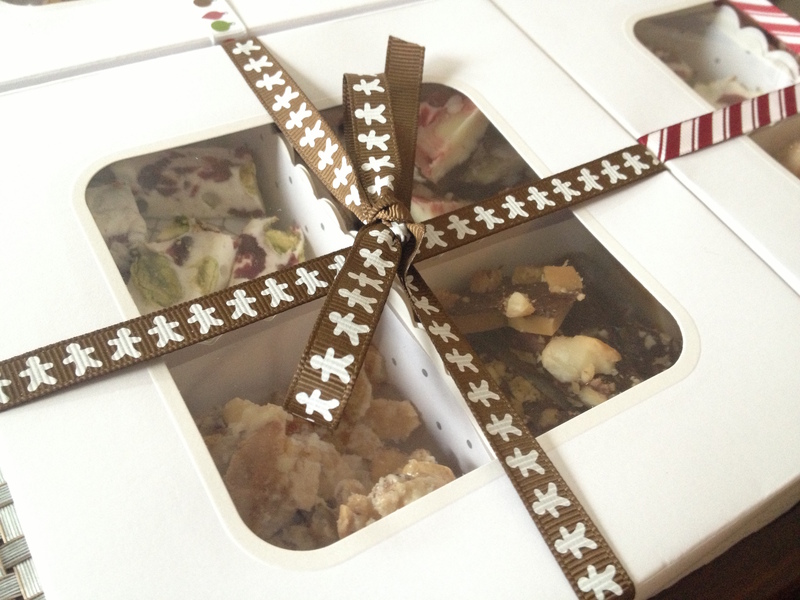 I love that there are four separate compartments for the goodies, and everything fits together so nicely. I tried not to pick a favorite, but the gingerbread men are clearly the best. Clearly. 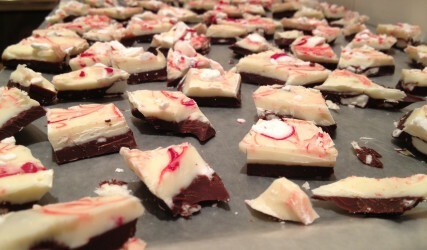 Nothing puts me in the holiday spirit quicker than whipping up a batch of peppermint bark. 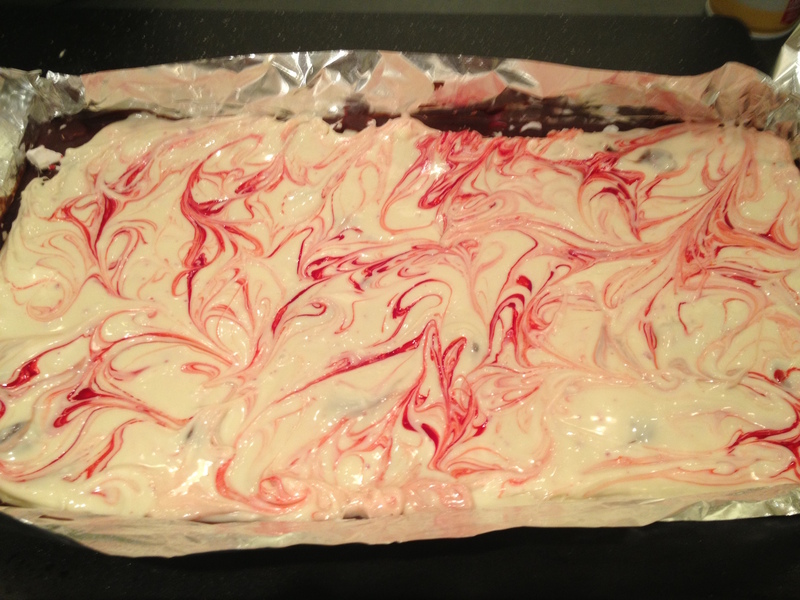 I use the same recipe every year, but I change the decoration of it. 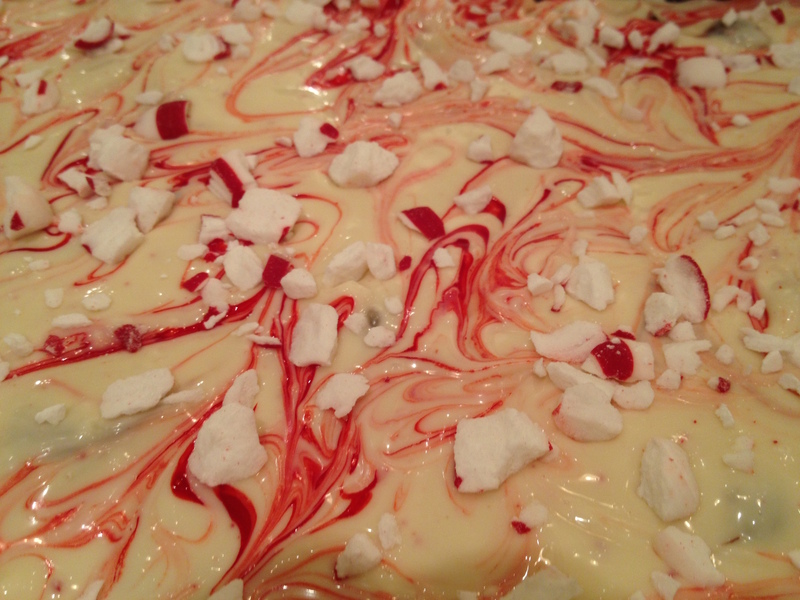 This year I opted to dot the white chocolate with a little food coloring and create a red swirl in it. Next year… who knows? 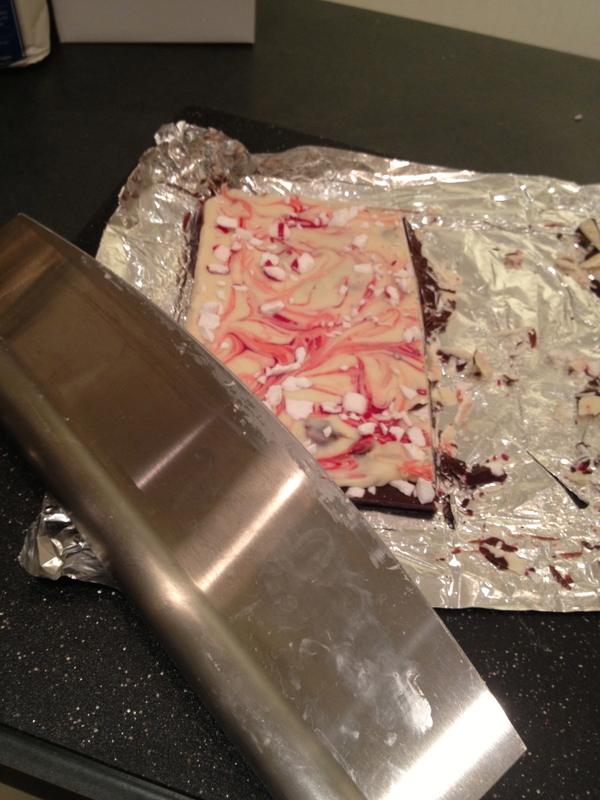 Line the baking sheet with parchment and lightly coat with spray, set aside. 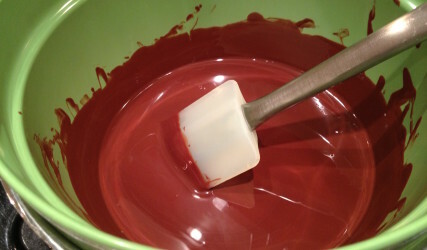 In a double boiler, melt the dark chocolate, stirring occasionally and scraping down the sides with a rubber spatula to avoid scorching. 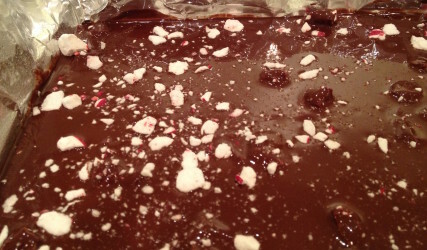 When the chocolate is melted, stir in 1 teaspoon of the peppermint oil and add a little handful of the crushed candies. 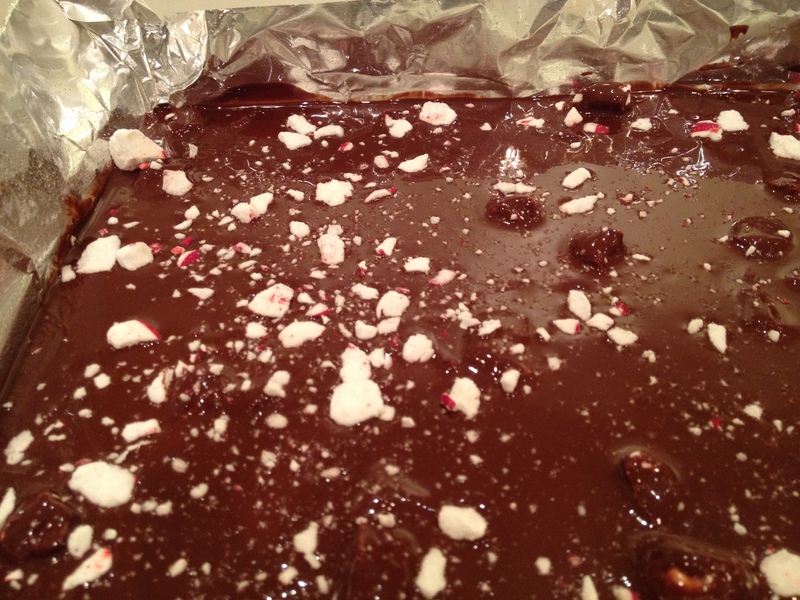 Spread the melted dark chocolate onto the prepared pan, evenly. 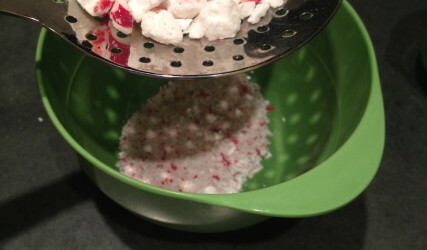 Sprinkle with a few more of the candies. 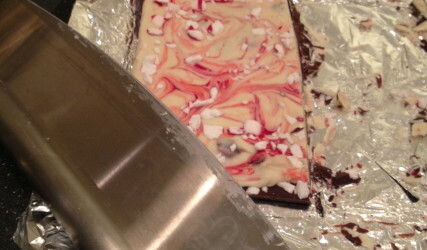 Let cool and harden in the freezer. 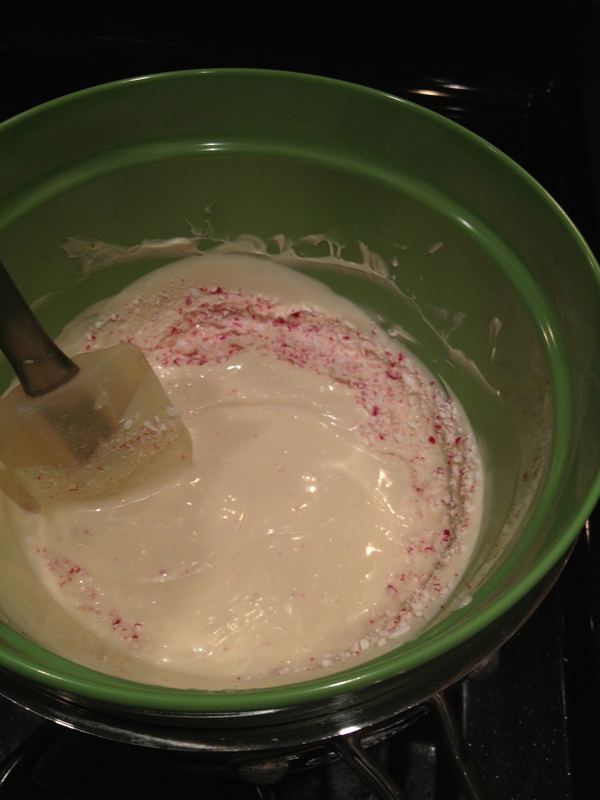 Meanwhile, start the white chocolate in the double boiler, same as before. 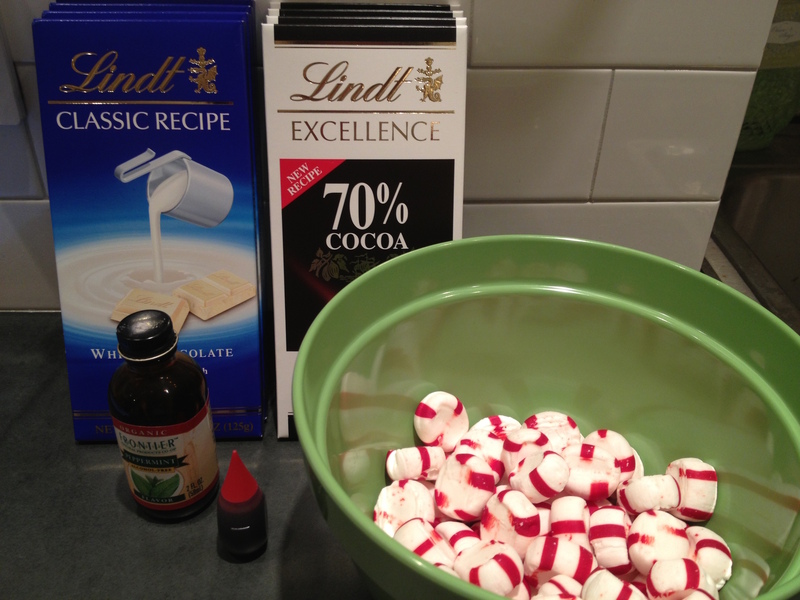 When the chocolate is melted, slowly stir in 1 teaspoon of the peppermint extract and the tiny peppermint scraps. 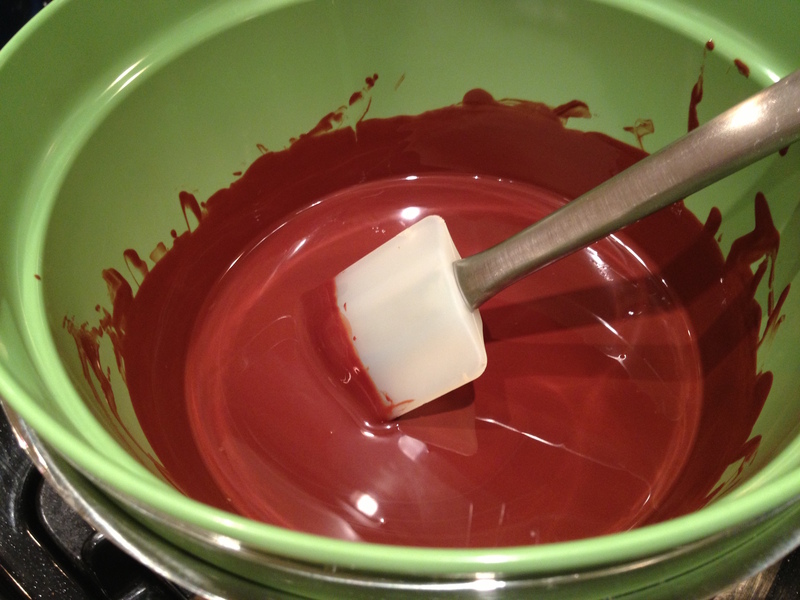 Evenly pour the white chocolate over cooled the dark chocolate layer; spread quickly and very gently! 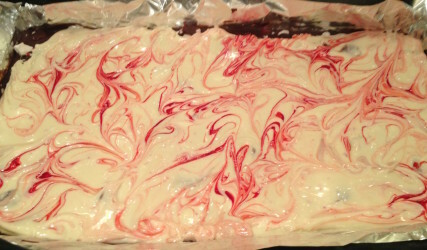 Drop a dot of red food coloring and swirl into a pretty pattern- repeat. 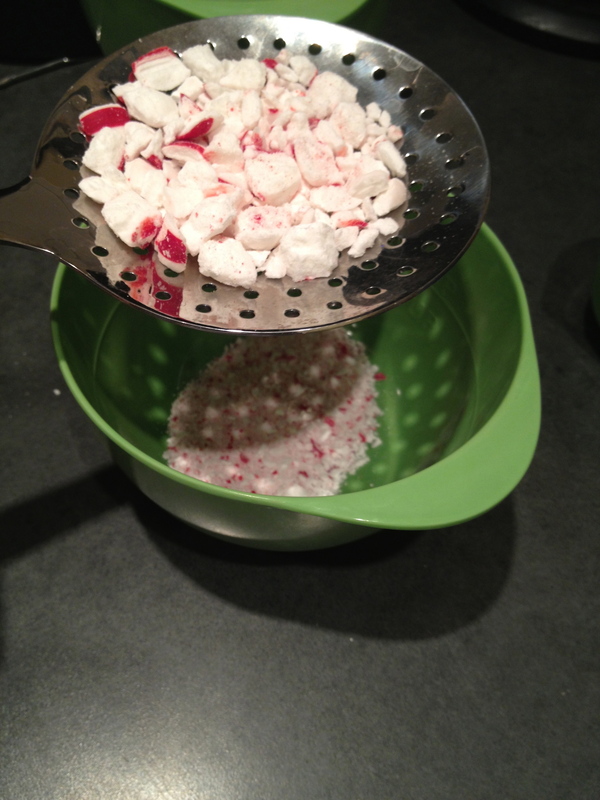 Then sprinkle with the remaining crushed candies. 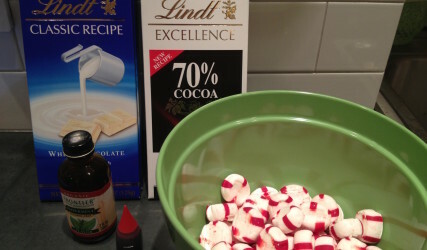 Let harden completely before you start cutting it into bite size pieces.